Fat is a protective confinement cell for toxins. The toxins that enter your body through chemicalized food, polluted air and water, toxic cleaning and cosmetic products, etc. are stored in your fat cells if not flushed out naturally. When you begin to lose weight (burn fat), the toxins leave their cozy fatty storage bins. They enter your blood stream, do all those terrible things toxins do, and make you feel like crap: stressed out, tired, irritable... hangry. The most annoying part is they mess with your success. Have you ever hit a plateau when losing weight? Couldn't lose the last five, ten pounds? This is a natural defense. Your body is retaining water to dilute the poisons that are now running around free in your system. Wellness Resources explains how this works in greater detail in a blog post about detoxification and weight loss. You absolutely need to get these toxins out so you can start feeling great and continue losing weight. Good news is you don't have to do some crazy juice fast, Master Cleanse, or colon cleanse to detox. 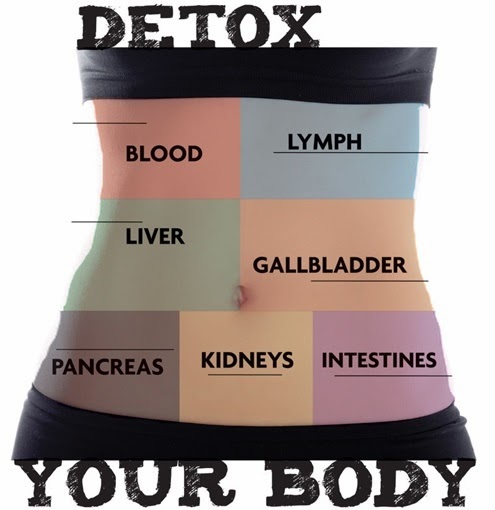 Your body has the ability to detox naturally and safely. Pee: The kidneys are responsible for flushing waste from the blood. Make sure you give them what they need by drinking plenty of water- at least eight glasses a day. Poop: One or two well formed bowel movements every day is one of the best ways to give toxins a one-way ticket out of your body. Increase the fiber in your diet to help make this happen. Also be sure to drink lots of water. Perspiration: Your skin is your single largest organ of elimination. Make sure you’re maximizing the detox-potential of your pores by working up a sweat at least three times a week. Belly breaths: The lungs are the unsung heroes of the body’s detox squad. With each breath, they bring in fresh oxygen and help transport it throughout the body. Breathing deeply and fully will oxygenate your brain, body, and spirit, transforming your health in the process. I encourage you to also take responsibility for the toxic exposure you're able to control. The less toxins coming in, the less you need to worry about getting out. Replace conventional foods, cosmetics, cleaners, and person hygiene products with homemade, homegrown, or organic stuff. Wear natural fiber and metals. Seek alternatives to plastic whenever possible. Learn more about how to avoid toxins as a consumer at ewg.org. If you're concerned that your body has an exceptional toxic load, I suggest getting your blood tested. Once you know what's in there, you can work with a naturopathic doctor to create a personalized detox plan. The post is part of Unprocessed Fridays on Girl Meets Nourishment! Great article! Thanks for sharing your story. I really appreciate your dedication to a healthier humanity and planet!